Art for children is serious work. Just as you may take great pride in a well thought out email or a presentation at work, a child takes great pride in the thought and execution of their art work and will beam when you display their masterpieces. Modern refrigerator panels are often not magnetized; and if they are, may be a difficult display area and cause cluttering. Instead, invest in this low-cost and easy option for display. It takes less than 15 minutes to create and costs less than $10 to purchase the supplies. Step 1: Find a wall with space near the upper portion for a art display (keeps little fingers from pulling it down and tearing art work). Possible locations include: a family room, dining area, playroom or child’s bedroom. Step 2: Depending upon the length of your desired art display, decide whether you will need 2 or 3 points of contact on the wall for the ribbon. Longer displays (stretching the entire length of a room) should have 3 points of contact. Smaller displays (part of a wall) will only need 2 points of contact. For each point of contact, you will need 1 tack, 1 painted wooden shape to cover the tack (available painted or unpainted at craft stores like Michael’s). Wood trains are used above to match the theme of the children’s room. Step 3: Measure the length of your desired art display. You will need slightly more ribbon than the exact measurement to allow for give. The ribbon you select should be medium width, around a 1/2 inch and should be sturdy and cloth-like, but flat. Step 4: Starting on one end, tack the ribbon to the first point of contact and proceed until each of the points of contact are tacked with ribbon. Keep your ribbon fairly snug and avoid too much drooping. Step 5: Glue or use double sided tape to attach the painted wooden shapes to the top of the now tacked points of contact. 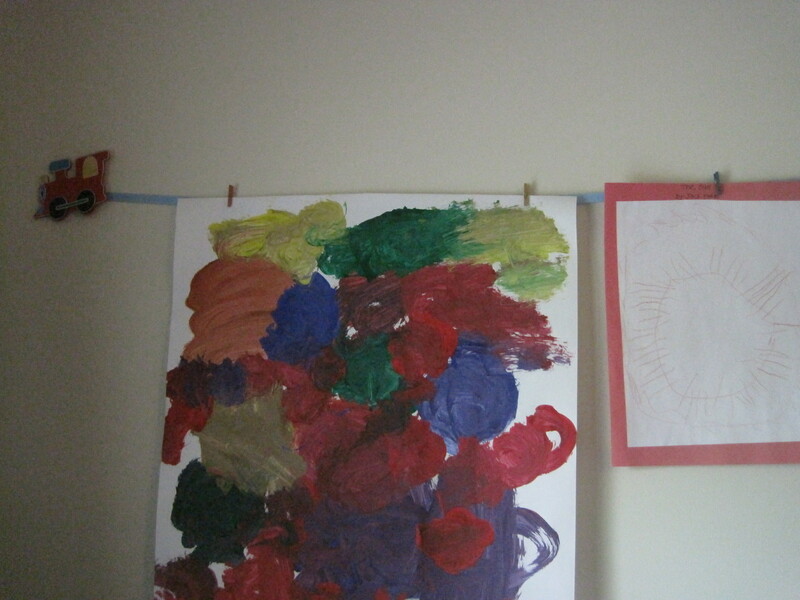 Step 6: Select artwork and attach to ribbon using small clothespins. 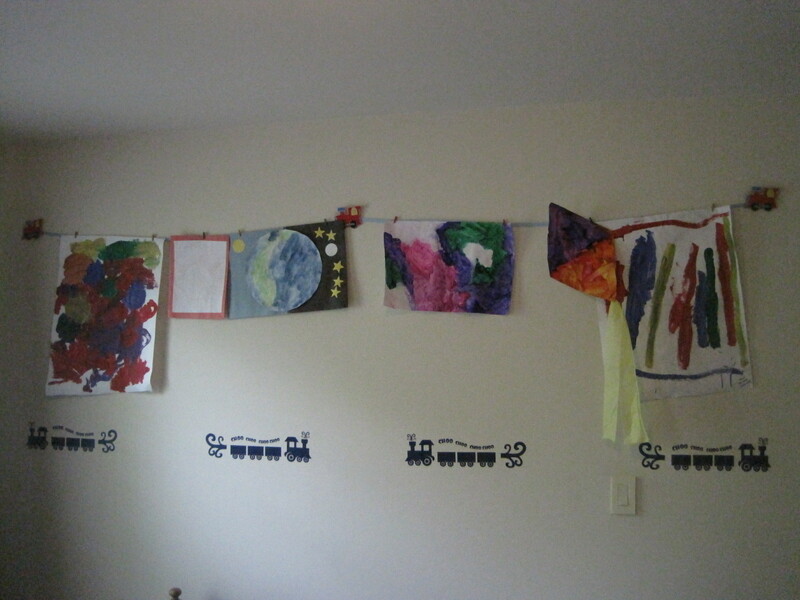 Ask your child which pieces he is proud of and why? You can even add a construction paper backing to more flimsy paper, as seen above, to frame exceptional drawings. Note the child’s name and date in the bottom corner and ask your child to give the art work a title.